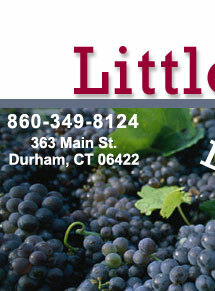 At the Little Rooster it is our goal to provide you with the right wine for you to enjoy. Our selection includes customary whites, reds, and champagnes along with interesting local, imported and dessert wines. Our knowledgeable staff can help you select the right wine for any occasion. Check out the great selections. We have beer for all tastes. Choose from a variety of beer selections including imported, domestic, malt alternatives and more. Spirits are categorized into "brown" (cognac, whisky...) and "white" (vodka, gin,...). Come in and browse our selection of "white" and "brown" spirits along with specialty spririts.